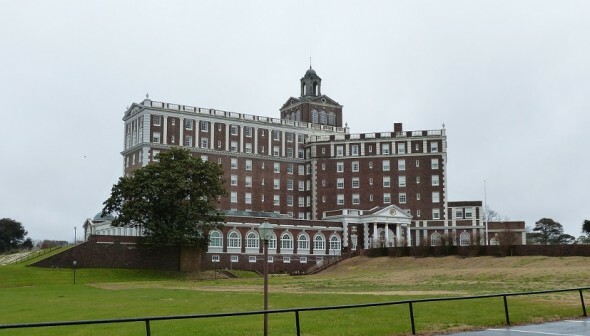 The idea of the “Grande Dame of the Shore” took hold decades prior to the Cavalier Hotel’s construction, following a 1907 fire that destroyed Virginia Beach’s most prominent resort. In the 1920s, as a rail line was extended out to the city and commercial and residential development began to alter the landscape, the Virginia Beach Resort and Hotel Corporation was formed to make the resort a reality. The regionally prominent and prolific architectural firm of Neff & Thompson designed the Cavalier, incorporating commercial space for tourists to shop on site and providing for all of the latest modern amenities. The 200 guest rooms at the Cavalier, each twelve by twelve feet, possessed hot water, cold water, sea water, and ice water spigots. On opening day, the Cavalier was toured by over 7,000 people. The hotel was the biggest news in Tidewater in a generation. Official celebrations lasted a week, and one event included daylight fireworks depicting life-sized cavaliers on horseback. Almost immediately, Virginia Beach’s premier hotel began to attract high society vacationers. The Who’s who list of famous visitors includes 9 U.S. presidents, First lady Edith Bolling Galt (a regular visitor), and Eleanor Roosevelt, who came with the Girl Scouts. Celebrity clientele included Judy Garland, Frank Sinatra, Betty Grable, Jean Harlow, Bette Davis, and F. Scott and Zelda Fitzgerald. Vacationers enjoyed leisure activities such as daily or weekly concerts, plays, horseback riding, golf, miniature golf, shooting, hunting, archery, tennis, and boating. A turning point in the building’s history occurred in 1942, when the Cavalier was annexed by the Navy for use as a radar school. Three years later, when the hotel was returned to its owner, the building was badly in need of restoration. A subsequent series of renovations occurred between the 1940s up through the early 2000s; the interior layout of the guest rooms was heavily altered, with most rooms expanded outside of their original, small footprints. The public spaces of the Cavalier, however, remain largely intact. Especially notable are the building’s Rotunda Lobby, the Raleigh Room (the lounge) and Pocahontas Room (the dining room), which retain much of their original detailing, including plaster walls, historic doors and transoms, and the terrazzo floor in the Raleigh room. The hotel’s lovely salt water pool and sunlit loggias also remain intact. 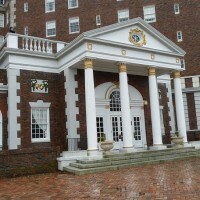 The Cavalier Hotel was found significant at the local level for its architecture and its role in social history as one of Virginia’s preeminent resorts. The building has recently changed ownership and will be fully restored as a functioning hotel. The Cavalier is currently the subject of an ongoing, historic rehabilitation tax credit renovation.